Ultimate LRS provide a long range RC and fast telemetry link. An Android device running Tower app, connected via USB (USB OTG cable + FTDI cable) or via bluetooth. Bluetooth is a good solution because you’ll get rid of any cable to your RC TX. And every laptop, smartphone or tablet has a bluetooth module, so you can run Tower or Mission Planner on it, see your plane/quad on the map, see the artificial horizon, change parameters, select waypoints etc. However bluetooth is less reliable than a cable, and can disconnect from time to time. Also check instructions provided by rcgroups user aethertop here, which are more detailed than below. ULRS will be connected via a small bluetooth module that can be found for example on ebay. A bluetooth link is very similar to a serial link, that’s why the bluetooth module will be connected on the serial port of the ULRS module. There are two main type of bluetooth modules.The module used here is a HC-05 bluetooth class 2 such as this one (datasheet), but many other bluetooth modules should work. Notice that the configuration or HC-06 modules is be slightly different but there are many tutorials on internet about this. The first thing to do is to tell the bluetooth module the baudrate to use. This is a one-time operation, that the module will save in eeprom and remember forever. Some modules are working at 3.3V, some are working at 5V, and some can select their voltage. 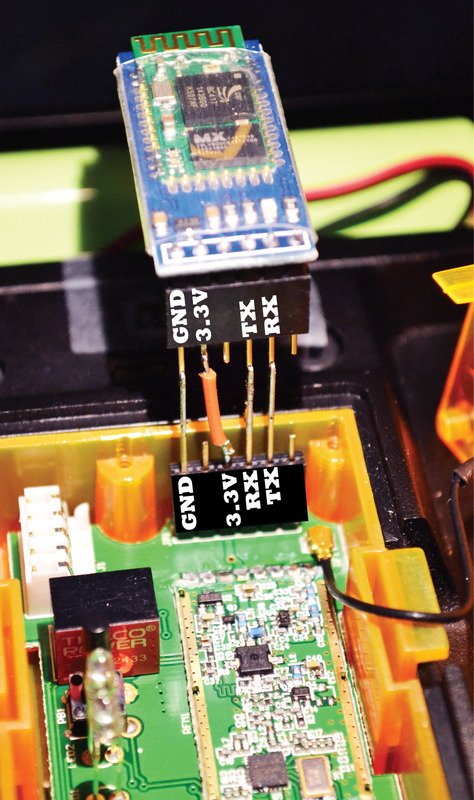 It’s recommended to use a BT module that matches the voltage of your ULRS board. Else, consider using a voltage shifter such as this one. To configure the baudrate of the BT module, it must be put in a special mode that will make him receptive to special commands that we’ll send on the serial port. This operation must only be done once per module, and will then be retained forever. The module is then in configuration mode, and its LED will flash slowly (every 2 seconds). Then connect with a terminal (or Arduino environment) at 38400 bauds, this is the default baudrate when the BT module is in configuration mode. 4. Type “AT+UART:57600,0,0“, the module should answer “OK“. Notice that some modules require to use “=” rather than “:“, which would give “AT+UART=57600,0,0“. Tower is a ground control software, equivalent to Mission Planner for Android devices. Almost any ground control software will work, because ULRS will simply transfer transparently any serial data it receives from the flight controller, and the bluetooth module will do the same. It’s really similar to having connected a long cable between the flight controller (APM or similar) and the ground station software (Mission Planner or similar). On the next power up (without the ‘Key’ wire) the BT module will run at 57600 bauds. 4. Choose Connection type : bluetooth. Notice that no baudrate has to be configured in Tower when using a bluetooth connection. 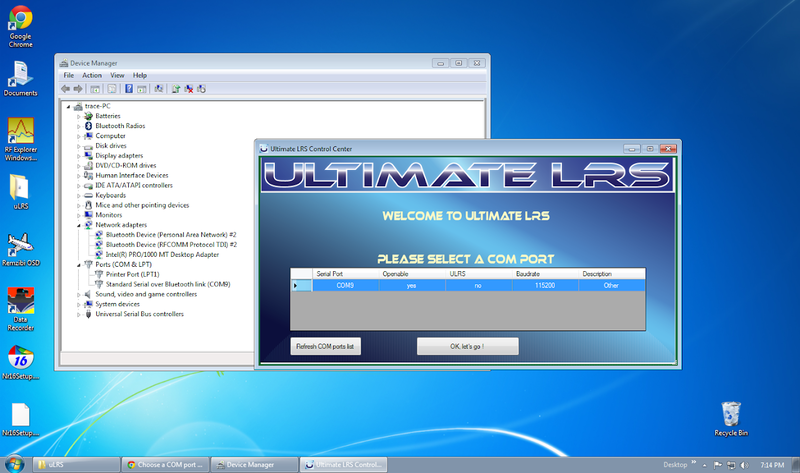 The initial COM ports detection of ULRS CC freezes when BT is powered on on a PC. Here’s a workaround. Instead of a serial BT module, can I use a pair of 915mhz 3dr rádios to link the OrangeRx(TX)with my laptop? Hi Daniel, in theory yes, anything that can transfer the serial signal will work. But in practice I think the 3DR modules will be too slow. These aren’t supported yet, but will be supported soon. I’m anxiously waiting for these to be supported. Just got mine from HK. Playing with some OpenLRSng firmware, I’ve had some luck with the TX as RX firmware in the Rx. The telemetry link is barely usable in the Tower App and unbearable in Mission Planner. Also, there are no FTDI pins on the Rx board, so something will have to be rigged up. I have had to use an ASP programmer. Looking forward to Ultimate LRS firmware on these! Yes, ULRS was made from the beginning for fast telemetry and works fine with all GCS softwares, including Tower, Mission Planner, APM Planner, Qground Control etc. Thank you for the reply. I have one on the way, perhaps I can do some testing if you like. It seems to me that they would be a good choice since they are about the same price and all integrated. I will take pictures when it arrives. Yes, it’s a very good choice, I’m interested if you can send me an email when you get them. Thanks ! I am also willing to do what I can to help. Any pictures or testing let me know. Keep up the good work! Would it be possible to use Control Center and do firmware THROUGH bluetooth? That would be awesome. I’m able to add and connect a new COM port through my computers bluetooth, and Control center sees it – but it won’t work. mmm, normally not, because the bootloader requires a signal on the DTR pin, which is not connected via the bluetooth module. However I’ll check, maybe that with a custom bootloader it would be possible to do it without the DTR pin. Just an FYI, when the bluetooth module is connected, you can’t use an FTDI adaptor at the same time. I had to open my module back up and disconnect the bluetooth to do firmware updates and make changes in Control Center. I might wire up a little switch for the bluetooth on the outside of the module, that way I don’t have to keep taking it back apart. The FTDI to PC (missionplanner) works fine, Drone is on the map, parameters are loaded. FTDI to Android didn’t work. Well now i put back my bluetooth module into the OrangeRX i can see my drone on the map in Tower/Droidplanner 🙂 i did nothing special, maybe just a restart of the phone! Works Great!! it was hard to set my bluetooth module to 115200 but it works now! Thanks! Is there any method to get RSSI into Tower/missionplanner? For the RSSI, there’s no injection directly in mavlink (but this could arrive soon). For now you can get the RSSI on a pin, filter it, and send it to an analog port of the APM. Yes and when i done that i have RSSI information about the 433MHz link into Tower/droidplnanner/Missionplanner? Thank you for your excelente work. About Bluetooth i follow instructions but no luck..Bluetooth baud is 115200…mission planner serial1 is 115200..and iam using 1w tx with 100mw rx…only telemetry doesnt work…appreciate help. Please check first without bluetooth, and notice that APM will communicate at 19200 (serial1_baud = 19), while mission planner must be connected at 115200. Thank you very much for this fantastic work. I now have telemetry working between 2x1W 433 orangerx units and Bluetooth to my computer. Brilliant! 1. When bound, both units show red and blue lights constantly on. Is this normal? 2. The setup works great with your firmware. As an experiment, I tried using openLRsng in Google Chrome and flashing “TX as RX” onto the APM TX but without luck. Do you have any ideas why this doesn’t work? No worries if not, just curious. I have emailed you a picture of my setup showing the lights mentioned in point 1. Thanks, yes it’s normal that all LEDs are ON. Is it confirmed that using BT reduces the range significantly? BT is on 2.4Ghz, LRS is on 433, they aren’t even harmonics. Seriously using BT for telemetry is such a practical thing, Even if it reduces the range by 20% I’d probably still use it. It’s based on feedbacks from two users, but you’re welcome to test and report your results. I agree with you that normally the range shouldn’t be affected, or only slightly.